One day, when I returned to Leeds from York, shunning the heavy traffic on the A64, I drove along the B1224, which runs in the peaceful fields and meadows, via Wetherby. Turning to the right at a village of Long Marston, I went along the narrower country road leading to Tockwith. Then on the way, 6 or 7 miles to the west of York, I found an obelisk of probably some 25 feet in height on the roadside. 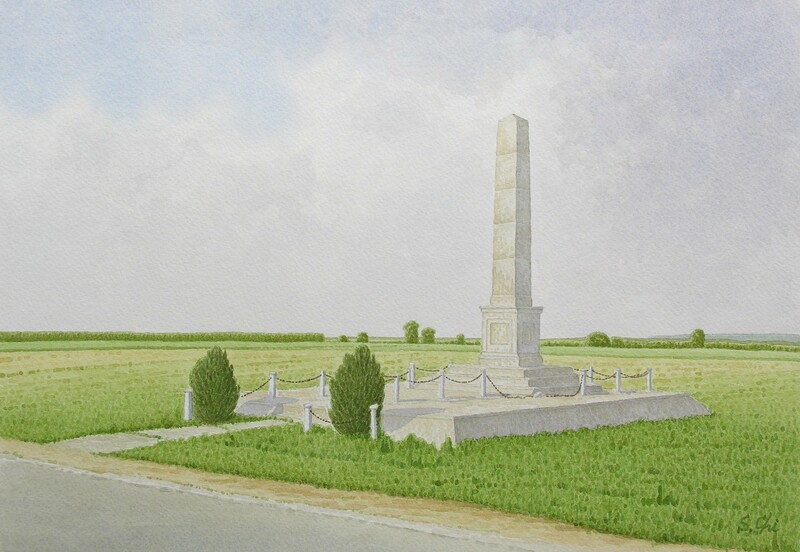 The obelisk was erected to commemorate the Battle of Marston Moor. The battle, the greatest one during the Cilil War, was fought here on the 2nd of July in 1644. The Royalists army of 17,000 to 18,000 soldiers, which was commanded by Prince Rupert, a nephew of Charles I, took up their position in the north of the moor. Rupert is reputed to be the most talented cavalry's commander in English history and the Parliamentarians were afraid of him, calling him the Royalists' "Goliath". The Allied armies from 27,000 to 28,000 took up their position in the south. The Allied armies were comprised of the Scots army of 17,000, which was commanded by Alexander Leslie, Earl of Leven, the Yorkshire Paliamentarians Army of about 5,000 commanded by Sir Thomas Fairfax, and the Army of Eastern Association of about 6,000, which was organised by Edward Montagu, 2nd Earl of Manchester and Oliver Cromwell. Being deployed along a small ditch in the moor, two armies of both sides were watching each other. The battle was fought as follows. There was a flurry of gunfire during the afternoon, but there was no sign to develop to fight. Towards evening, the commanders of Allied armies gathered on a small hill which was later called Cromwell's Plump to watch the Royalist army. Then they saw columns of smoke ascending. It showed the Royalist's soldiers made fires to prepare their supper. This was the definitive moment of this battle. Taking it the time had come, the Allied armies' cavalries of both wings charged at the Royalists. Infantries of the centre also advanced and prepared for all-out attack. Being caught off guard, the Royalists army was thrown into a state of confusion, but they fought bravely in disorder. The numerous Allied armies made a seris of attacks against the Royalists. With the odds against the Royalists, Prince Rupert withdrew his cavalry to try to rebuild it. However, some of the soldiers thought Rupert's tactics were his retreat. And they fled from the field, some following Rupert's cavalry and some running away for York. This invited the collapse of the Royalists army, and the battle was ended by the complete defeat of them. The day was long in summer, but it became quite dark when the battle ended. This was a major defeat, the indication of Charles' eventual end. Marston Moor is said to be once wasteland, only furze growing densely. Now it is fruitful farmland. Hedgerows of hawthorn extend there and a couple of houses and trees can be found here and there. I could see the gentle Hambleton Hills to the north and the Pennines to the west. The horizon of the Plain of York was in the haziness to the east and south. Seeing the peaceful fields spreading before me, I could not imagine the severest battle during the Civil War was taken place here. Standing in the old battle field, I only remmembered following Basho's haiku*. From the ancient days, many battles were in Yorkshire. As I described before, the battles between the Brigantes and the Romans also broke out here. The battle field were this very Yorkshire. I pick up the names of other battles fought in Yorkshire, which I am interested in: the Battle of Hatfield Chase on the 12th of October in 633, the Battle of River Winwead on the 15th of Novenber in 655, the Battle of Stamford Bridge on the 25th of september in 1066, the Battle of Boroughbridge on the 16th of March in 1322, the Battle of Wakefield on the 30th of December in 1460, the Battle of Towton on the 29th of March in 1461. *Haiku is a Japanese fixed verse form, consisting of seventeen syllables arranged in three lines of five, seven, five syllables. Basho Mastuo(1644-1694) is the greatest haiku poet in the late 17th century.